Our 18” x18” decorative Nahualá huipil* cushion cover will be a beautiful addition to your seating areas and are guaranteed to start conversations! This cover features a central panel of a huipil embroidery in the style from Nahualá in the Central Highlands of Guatemala most often incorporating stylized animals and figures or geometrics in colored thread on a dark background. 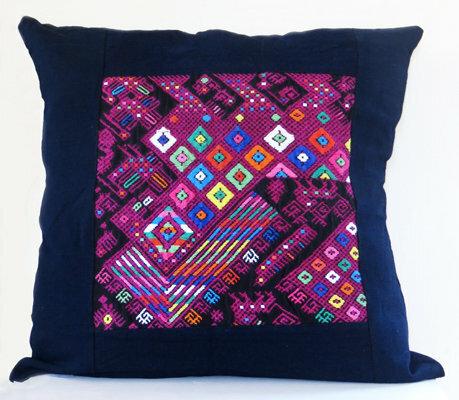 Each huipil embroidery is set off by a neutral navy blue background fabric. Due to the vast number of variations in huipil embroideries available, the exact huipil designs samples that you see here may not be available. Please select the village style you prefer and allow us to choose the embroidery for you.